Vintage From Paul is delighted to offer this stunning Central Glass Green Depression Balda Etch Cheese & Cracker Tray. Central Glass Works Balda Etch No. 410. This was the largest pattern line created by Central Glass Works. Produced during the early 1920s to the late 1930s. It received its name from the designer that created it, Joe Balda. It can be found on several different color glasses including clear, amber, blue, green, lavender and pink. Each of the available Central Glass Green Depression Balda Etch Cheese & Cracker Tray is in pristine condition with no defects or flaws noted. 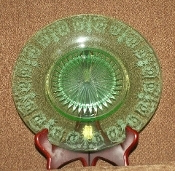 The Central Glass Green Depression Balda Etch Cheese & Cracker Tray measures 10-1/4 inches in diameter.